The Global Volcanism Program has no activity reports for Cherpuk Group. The Global Volcanism Program has no Weekly Reports available for Cherpuk Group. The Global Volcanism Program has no Bulletin Reports available for Cherpuk Group. Severny Cherpuk (South Cherpuk) and Yuzhny Cherpuk (North Cherpuk) are two cinder cones SW of Ichinsky volcano that comprise the largest monogenetic volcanoes of the Sredinny Range. 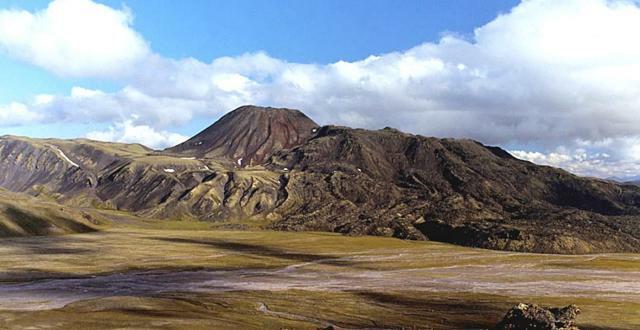 Severny Cherpuk, 21 km SW of Ichinsky, is a double cone that was constructed along the crest of the Sredinny Range and fed massive 1.8 km3 lava flows down both sides of the range to the NW and SE. A narrow tongue of the SE flow diverted an addition 10 km to the south, for a total distance of 22 km. Yuzhny Cherpuk, 11 km SSW of Ichinsky, produced a 1.7 km3 lava flow that traveled 18 km S and then SE. The flow descended to 640 m elevation and dammed tributaries of the Ketachan River, producing three lakes. The two cones are sometimes considered to be satellitic cones to Ichinsky, but Pevzner et al. (2000) noted petrological distinctions that suggest an independent origin. Unpublished radiocarbon ages revise those in Pevzner et al. (2000) and indicate that both cones were formed about 6500 years ago. Pevzner M M, Melekestsev I V, Volynets O N, Melkii V A, 2000. South Cherpuk and North Cherpuk - the largest Holocene monogenetic volcanoes on the Sredinnyi Range of Kamchatka. Volc Seism, 21: 667-681 (English translation). Ponomareva V, Melekestsev I, Braitseva O, Churikova T, Pevzner M, Sulerzhitsky L, 2007. Late Pleistocene-Holocene volcanism on the Kamchatka Peninsula, northwest Pacific region. In: Eichelberger J, Gordeev E, Izbekov P, Kasahara M, Lees J (eds), Volcanism and Subduction: the Kamchatka Region, Amer Geophys Union, Geophys Monogr, 172: 165-198. There is no Deformation History data available for Cherpuk Group. There is no Emissions History data available for Cherpuk Group. Yuzhny Cherpuk cinder cone (left-center horizon) and its andesitic lava flow are located 11 km SSW from Ichinsky volcano. The fresh-looking lava flow was erupted about 6500 years ago and traveled 18 km. Severny Cherpuk (South Cherpuk) and Yuzhny Cherpuk (North Cherpuk) are two cinder cones SW of Ichinsky volcano that comprise the largest monogenetic volcanoes of the Sredinny Range. Severny Cherpuk, 21 km SW of Ichinsky, is a double cone that was constructed along the crest of the Sredinny Range. Copyrighted photo by Adam Kirilenko, 2000 (Holocene Kamchatka Volcanoes, www.kamchatka.ginras.ru). There are no samples for Cherpuk Group in the Smithsonian's NMNH Department of Mineral Sciences Rock and Ore collection. Large Eruptions of Cherpuk Group Information about large Quaternary eruptions (VEI >= 4) is cataloged in the Large Magnitude Explosive Volcanic Eruptions (LaMEVE) database of the Volcano Global Risk Identification and Analysis Project (VOGRIPA).